The I-Team began investigating private ambulance regulations after a triple fatal crash in Bellwood, illinois. CHICAGO (WLS) -- Last March a horrific ambulance crash in suburban Bellwood killed all three people on board. The ABC7 I-Team went to work to find out what led up to one of the worst ambulance crashes in state history. What the I-Team uncovered was troubling. Documents revealed an emergency medical technician with a long criminal history and a state licensing system largely unregulated. That was "Code Red" for critics of the state's lax regulations for private ambulance workers. And now, following the I-Team's reporting, the Illinois Department of Public Health has announced plans to strengthen the state's licensing system. The I-Team wanted to know who is protecting the public on private ambulance rides? Chicago attorney Tom Zimmerman said there is good reason to have major concerns about the state's current licensing system. "If people really knew how little background checking the state agencies does for these licensed professionals they would be shocked and outraged," he said. Zimmerman represents Dora Williams in legal action related to the crash in which her husband, Prentice Williams, was killed. She said he was studying to be an EMT and helping out with the transport last March when the accident happened. "I have dreams about him and I can see him and I don't want to wake up." Mrs. Williams says she is haunted by the death of her husband. He had been helping ambulance driver James Wesley transport a kidney dialysis patient when the vehicle careened out of control into a building. Williams, the patient Larry Marshall, Jr., and driver Wesley all died. An I-Team investigation revealed Wesley had cocaine in his system at the time of the crash and that he was an ex-con with a rap sheet, including a drug conviction he didn't disclose, which would appear to disqualify him from having a state emergency medical technician license. A lawyer representing the former ambulance company told the I-Team, "Wesley was not authorized to take the ambulance." Zimmerman's concern is the state doesn't do even a cursory check on EMTs, instead depending on the honor system. Applicants are expected to report if they have any felony convictions. "We are concerned that due to the lax oversight of the state agency uh, that there may be other EMT's who are just as unqualified as this driver who are out there putting people's lives at risk," Zimmerman said. Currently as part of the Illinois licensing requirement, EMT and paramedic applicants are required to reveal felony convictions, many of which might disqualify them. But the state doesn't do background checks to see if applicants are being truthful. According to Illinois health department records, Wesley, the driver in this case, did not reveal his past felonies, and without a background check the state never knew he was a drug felon. On average the National Highway Traffic Safety Administration found there are 4,500 ambulance crashes in the U.S. each year, killing 33 people. 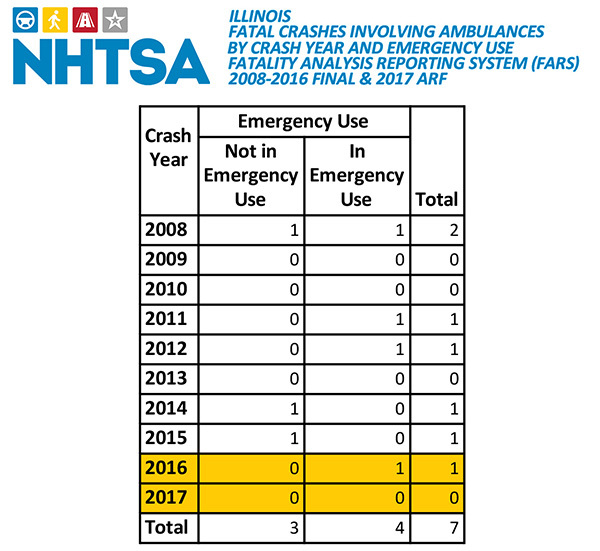 In Illinois the latest state figures reveal ambulance accidents have nearly doubled in the past five years. Chris Vandenberg, president of the Illinois State Ambulance Association and an owner of three ambulance companies, said many employers do the best they can to make sure their EMS employees are properly licensed. He stressed that crashes such as the one in Bellwood are rare, but also pointed to a lack of state oversight. Vandenberg said the burden of ensuring a safe workforce ends up on the employers, who may do background checks and random drug testing at their own expense. Vandenberg, who also owns three ambulance companies, said while crashes such as the one in Bellwood are rare, they point to a lack of state oversight. He said the burden ends up on employers who may do background checks and random drug testing at their own expense. "It's probably not the best way to handle it because I might do a background check but another company down the road says no jeez I'm going not going to, I'm just going to put an EMT or paramedic in the seat," he explained. The director of the Illinois Department of Public Health is now moving to close what he admitted is a loophole. IDPH Director Dr. Nirav Shah said that honor system loophole would be closed under new legislation his agency is drafting as a result of ongoing I-Team reports. "We are going to be moving to introducing fingerprint based background checks," Shah said. "Anyone who is applying for a new license or renewal will have to go the fingerprint based background check that we are going to be moving toward adopting." Dia Gainor, executive director of the National Association of State EMS Officials told the I-Team more states are migrating to the use of fingerprint bases FBI checks. "We have to be certain the individual is competent, we have to be sure they are going to function in an ethical way. We have to assure in an ongoing basis that they pose no risk to the public," she stressed. If that legislation passes, Illinois would fall in line with about half the nation that is already doing background checks on ambulance licensee. "Incidents like the one that occurred earlier this year as well as others that have occurred have exposed this loophole and we think it's time that we close it," said Shah. There are 65,000 licensed EMS workers in Illinois who would be required to undergo background checks under the legislation which state health officials hope to introduce in the next session of the General Assembly. Part of that proposal would allow amnesty for ambulance workers who may have failed to disclose previous felonies under the honor system. They wouldn't be prosecuted for lying, but could end up losing their jobs.